The Stegosaurus is one of the most easily recognizable dinosaurs amongst people due to the pointed plates along its back. It appeared in The Lost World, Jurassic Park 3 and Jurassic World. The dinosaurs lived in the late Jurassic period around 155 to 150 million years ago in western North America though some fossils have been recently found in Portugal. They were herbivores feeding on plants and they grew up to 30ft long and 9ft tall and weighed 5 tons. The Stegosaurus in the Jurassic Park movies were twice the size of what they were in real life. Despite the creature’s enormous size, it actually had a very small brain – comparable to a dog’s. Scientists have often debated the issue that such a huge creature couldn’t have such a small brain and it’s theorized they had a second brain in its tail. As already stated, their most distinguishing feature is their dorsal plates which arose from their skin rather than their skeleton and could be up to 2ft tall and 2ft wide. It was originally thought Stegosaurus developed these as some sort of armour but it is now believed that they may have helped to control the creature’s body temperature. Another unique feature of the Stegosaurus is its tail which had four dermal spikes about 2-3ft long which it used as a weapon. You can see this in action in The Lost World where it penetrated a log Sarah Harding was hiding in. 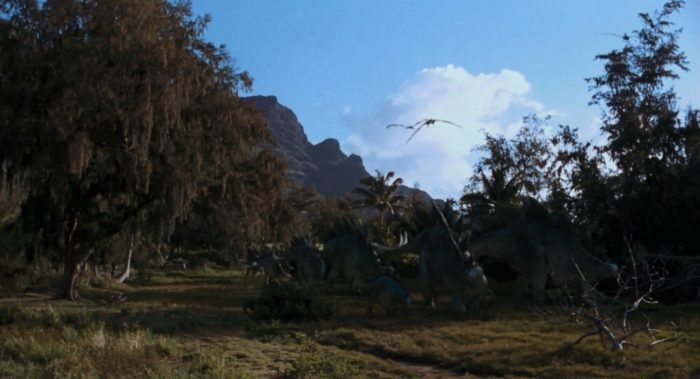 In the first Jurassic Park novel, InGen created 4 Stegosaurus on Isla Nublar and it was revealed later in the book, that more Stegosaurus were going to be hatched for the park. The characters eventually come across a sick Stegosaurus (in the film it was a Triceratops). It’s said that they get sick because the creatures inadvertently eat poisonous berries when they swallow stones to help with food digestion. Like in the film, Dennis Nedry steals a Stegosaurus embryo from the Cryo Labs. Late in the novel, when Tim climbs out of a tree, a Stegosaurus can be seen walking by, moving like a tortoise. At the end of the novel, only one Stegosaurus is alive and is seen on one of the monitors fighting a young Tyrannosaurus Rex. It is presumably killed in the Napalm attack. In The Lost World novel, only one Stegosaurus is encountered. When Sarah Harding wakes up on the shore of Site B, she finds out that a Stegosaurus has been licking her face when she was unconscious. She describes the creature having a small head, a huge body with a double row of pentagonal plates running along its back, and a tail with spikes on it. At first, she thought it was a mechanical creature but realised it was a real creature. 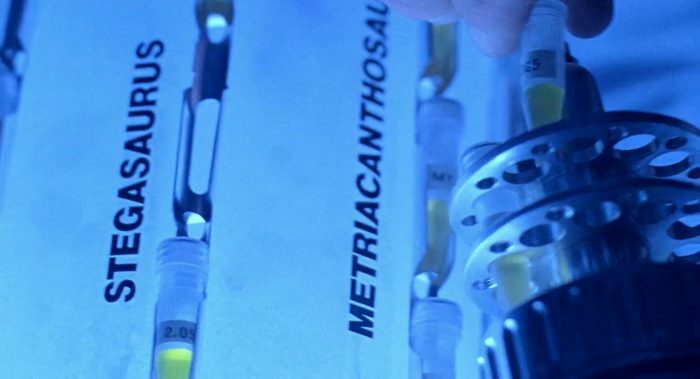 The Stegosaurus wasn’t seen in the first Jurassic Park movie though you could see its name on one of the embryo vials that was stolen by Dennis Nedry. 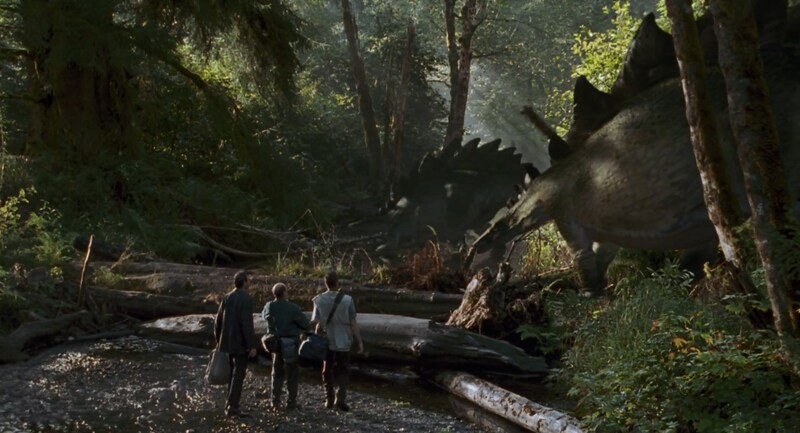 In The Lost World, Ian Malcolm, Eddie Carr and Nick Van Owen encounter a group of Stegosaurus along a river soon after they reach Isla Sorna. They meet Sarah Harding there who approaches an infant Stegosaurus to take its picture. When the camera became full, it started making noises which disturbed the herd of Stegosaurus. The herd attacked her but she managed to escape. 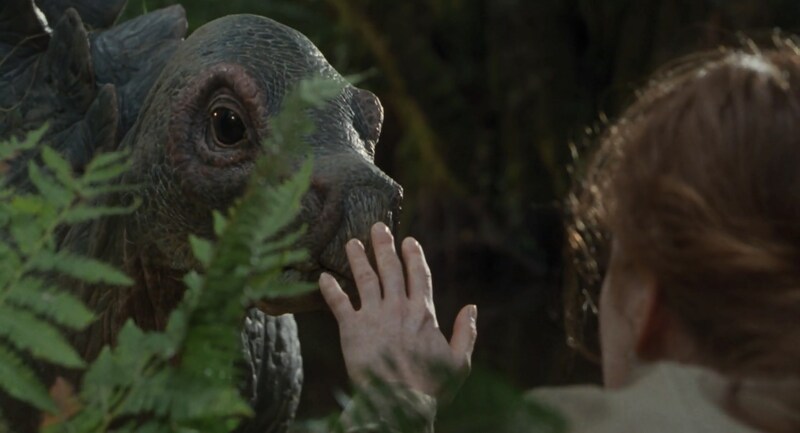 Later in the film, Peter Ludlow and his team capture an adult Stegosaurus and an infant. We see the Stegosaurus again at the end of the film migrating across the Isla Sorna. 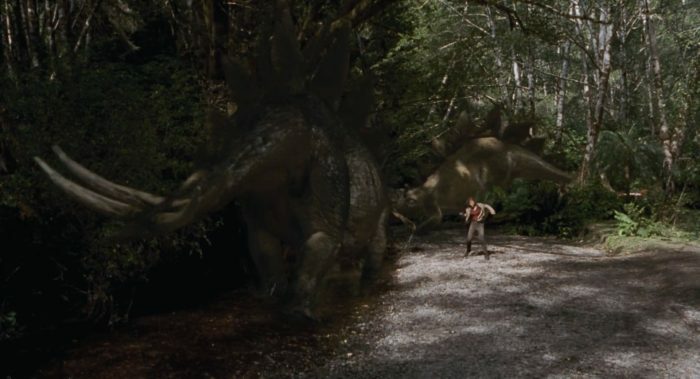 The Stegosaurus made a brief appearance in Jurassic Park 3. You can see a herd of them when the plane first flies over the island. Later, when Dr. Grant and the Kirby’s were on the boat, some Stegosaurus could be seen from the river. 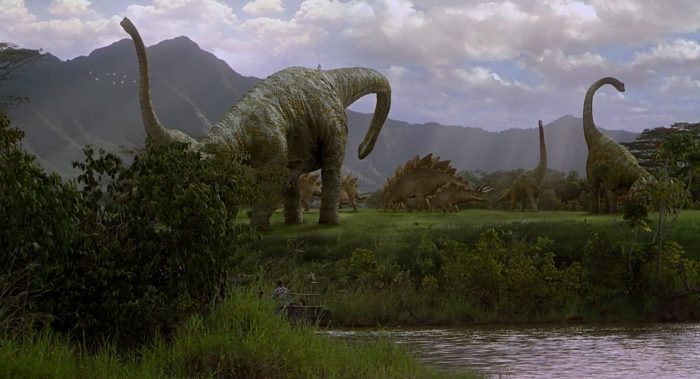 From the Jurassic World trailer, we can see a group of Stegosaurus by a river. Sorry for the “I” before “Stegosaurus”, it was a typo. fsd that is just the lighting.